Piezo1 is an ion channel that gates open when mechanical force is applied to a cell membrane, thus allowing cells to detect and respond to mechanical stimulation. Molecular structures of Piezo1 reveal a large ion channel with an unusually curved shape. This study analyzes how such a curved ion channel interacts energetically with the cell membrane. Through membrane mechanical calculations, we show that Piezo1 deforms the membrane shape outside the perimeter of the channel into a curved ‘membrane footprint’. This membrane footprint amplifies the sensitivity of Piezo1 to changes in membrane tension, rendering it exquisitely responsive. We assert that the shape of the Piezo channel is an elegant example of molecular form evolved to optimize a specific function, in this case tension sensitivity. Furthermore, the predicted influence of the membrane footprint on Piezo gating is consistent with the demonstrated importance of membrane-cytoskeletal attachments to Piezo gating. Piezo ion channels transduce mechanical stimuli into electrical activity (Coste et al., 2010). These channels – Piezo1 and Piezo2 in mammals – underlie many important processes in biology, including cell volume regulation in erythrocytes, cardiovascular system development, and touch sensation (Maksimovic et al., 2014; Ranade et al., 2014a; Ranade et al., 2014b; Cahalan et al., 2015). In electrophysiological experiments Piezo channels seem to be exquisitely sensitive to applied mechanical force: when the membrane of a cell is poked gently with a probe, or when pressure is applied to stretch a small patch of cell membrane on a gigaseal pipette, Piezo channels open (Coste et al., 2010; Lewis and Grandl, 2015). Studies have addressed how Piezo channels ‘sense’ and open in response to mechanical force. In one approach Piezo channels, purified and reconstituted into droplet bilayers, opened when force was applied by swelling a droplet (Syeda et al., 2016). This observation implies that Piezo needs only the cell membrane to couple mechanical forces to pore opening. In another approach, Piezo channels in patches excised from cell membrane blebs (Cox et al., 2016), or in cell excised patches with applied positive or negative pressure (Lewis and Grandl, 2015), open in response to pressure application. These observations also support the notion that Piezo only needs an intact lipid membrane to transduce force into pore opening. The reconstitution (Syeda et al., 2016) and excised patch (Lewis and Grandl, 2015; Cox et al., 2016) experiments suggest the ‘force-from-membrane’ hypothesis for mechanosensitive gating, which, in its simplest form, invokes lateral membrane tension as the origin of the ‘opening force’ (Sukharev et al., 1999; Perozo et al., 2002; Chiang et al., 2004; Teng et al., 2015). But other experiments suggest additional possibilities for force exertion. When blebs are formed on the surface of a cell by removing local cytoskeletal attachments, certain properties of Piezo mechanosensitive gating change (Cox et al., 2016). And more directly, Piezo gating is altered by applying force to a tether artificially attached to the channel (Wu et al., 2016). Therefore, while membrane-mediated forces alone appear to be sufficient to open Piezo, tethers attached to the membrane or to the channel itself also seem to play a role in Piezo gating. A partial molecular structure of a Piezo channel has been determined (Guo and MacKinnon, 2017; Saotome et al., 2018; Zhao et al., 2018). Piezo is a trimer of 3 identical subunits that form one central pore and three long arms that extend away from the center. A peculiar aspect of the structure is that the extended arms, which are made of transmembrane helices, do not lie in a plane as would be expected if Piezo normally resides in a planar membrane like most other ion channels. This property of the structure implied that Piezo likely curves the cell membrane locally into a spherical dome (projecting into the cell), which was confirmed by electron micrographs of small unilamellar lipid vesicles (Guo and MacKinnon, 2017). On the basis of Piezo’s demonstrated ability to curve lipid membranes locally into a dome, a mechanism for membrane tension sensitivity – called the membrane dome mechanism – was proposed (Guo and MacKinnon, 2017). Simply stated, the dome shape provides a source of potential energy for gating – in the form of excess membrane area 'stored' by curving the membrane – when the membrane comes under tension. If the Piezo dome becomes flatter when Piezo opens, then the projected (in-plane) area of the dome will expand, that is, the available in-plane area of the membrane-Piezo system will increase. Under tension γ, the flatter shape will be favored by energy γ ΔA, where ΔA is here the change in the projected area of the Piezo dome. Therefore, this model rationalized Piezo’s peculiar shape as a means to utilize, for gating purposes, the energy stored in a curved membrane under tension. However, the membrane dome model of Piezo gating only considered the shape of the membrane within Piezo’s perimeter and not the shape of the surrounding membrane, which is necessarily coupled to the curvature of the Piezo dome. In the present analysis we study the energetic contribution to Piezo gating provided by the shape of the surrounding membrane. Through membrane mechanical calculations, we show that the Piezo dome can strongly curve the surrounding membrane. We find that the energetic coupling between the shape of the Piezo dome and the surrounding membrane amplifies Piezo’s tension sensitivity, and may explain the experimentally observed regulation of Piezo gating by membrane-cytoskeletal attachments. Figure 1A and B show two orientations of the molecular model of Piezo1 in yellow, which from here on we refer to as Piezo. Shown in grey, a spherical cap is placed such that it intersects the protein near the middle of the transmembrane helices. This grey surface therefore corresponds to the mid-bilayer surface of the membrane. We call the grey spherical cap, with its embedded Piezo channel, a mid-bilayer representation of the Piezo dome. This dome shape, produced by curved Piezo channels embedded in lipid bilayer membranes, has been confirmed experimentally (Guo and MacKinnon, 2017). The intersection of the grey surface and the Piezo channel, shown in cyan, informs that the dome surface area is covered by approximately 20% protein and 80% lipid membrane. Note that, if the unperturbed configuration of the lipid membrane is planar, the Piezo protein must apply, through its curved structure, a distorting force on the membrane to locally bend the membrane into a dome shape. And, of course, the membrane applies an opposing force on the protein. The result is a stable, non-planar equilibrium configuration of the membrane-Piezo system with zero net force, in which the sum energy of the channel and the membrane is minimized. In the present analysis we do not consider the flexing of Piezo. Instead, we focus on the membrane shape associated with a particular (e.g., closed) Piezo configuration (Figure 1A and B). (A) Side and (B) top-down (projecting into the cell) views of the Piezo dome. The approximate position of the curved mid-bilayer surface of the Piezo dome is indicated in grey, with the cyan regions corresponding to the intersection of the mid-bilayer surface and the Piezo protein. (C) The curved shape of the mid-bilayer surface of the Piezo dome (indicated in grey) deforms the mid-bilayer surface of the surrounding lipid membrane (indicated in blue) and results in a membrane footprint of Piezo that extends beyond the size of the dome (see Figure 2A for further details). [The atomic structure of the Piezo protein in (A) and (B) corresponds to mPiezo1 with Protein Data Bank (http://www.rcsb.org) ID 6B3R.]. Since the surrounding lipid membrane connects smoothly to the Piezo dome, the curved shape of Piezo is expected to induce membrane curvature beyond the perimeter of the Piezo dome. The fundamental reason for this is, the energetic cost to curve a membrane contains a term proportional to the membrane’s mean curvature squared. As a result, a sharp transition from the curved dome shape to a planar membrane is associated with a higher energy than a gradual transition. This effect is shown in Figure 1C: the grey surface corresponds to the mid-bilayer surface of the dome in Figure 1A and B and the blue surface to the mid-bilayer surface of the surrounding membrane. We refer to the region of deformed lipid membrane outside the perimeter of the Piezo dome as Piezo’s membrane footprint (Phillips et al., 2009). The total energy of the membrane-Piezo system therefore has to include Piezo’s membrane footprint in addition to the Piezo dome. As we will show, Piezo’s membrane footprint not only influences the total energy of the membrane-Piezo system, but it also has a very large influence on Piezo’s ability to sense changes in membrane tension. where Kb is the membrane bending modulus (membrane bending stiffness), γ is the membrane tension, c1 and c2 are the principal curvatures of the mid-bilayer surface (which are functions of position on the membrane), and ΔA is the decrease in in-plane area associated with deforming the membrane out of its unperturbed (planar) configuration. The integration is carried out over the surface of the membrane footprint (see Appendix 1). In the integrand of the membrane bending energy in Equation 1 we did not include a contribution ∝c1c2 due to the Gaussian curvature of the membrane, which is independent of the shape of the membrane footprint, and a contribution due to the membrane spontaneous curvature (Helfrich, 1973). The latter contribution to the membrane bending energy may need to be considered if the bilayer contains lipids that induce intrinsic curvature. Next, we minimize GM by solving a differential equation corresponding to the first variation of Equation 1 set equal to zero – the Euler-Lagrange equation – subject to specific boundary conditions (Fox, 1987). This solution yields the shape of the lipid membrane when its energy is minimal. Using this shape, we calculate GM by evaluating Equation 1. We used two separate, previously developed methods – one analytical (Weikl et al., 1998; Turner and Sens, 2004; Wiggins and Phillips, 2005; Li et al., 2017) and one numerical (Peterson, 1985; Seifert et al., 1991; Deserno, 2004; Bahrami et al., 2016) – to carry out these calculations. The analytical solutions involve a 'small gradient' approximation of Equation 1 and are therefore only accurate for cases in which the membrane curvature is small. Nevertheless, the analytical solutions provide an important check (see Materials and methods) on the numerical solutions, which are not limited to membranes with small curvatures. Because Piezo can be highly curved, the solutions shown in the main text figures were calculated numerically. 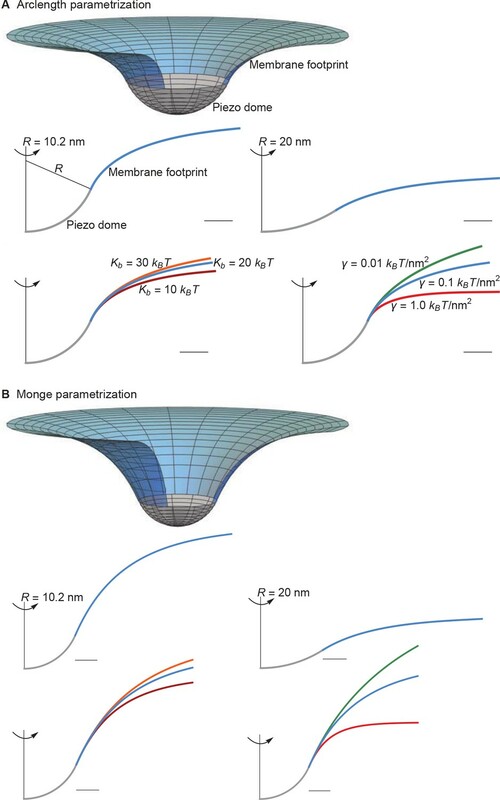 The shape of Piezo’s membrane footprint – and therefore its associated energy – depends on three key physical properties of the membrane-Piezo system: the basic shape of the Piezo dome, the membrane bending modulus Kb, and the membrane tension γ. The general shape of Piezo in a closed conformation is well defined and approximated here as a dome, or spherical cap, of area 390 nm2 and radius of curvature R=Rc with Rc=10.2 nm (Guo and MacKinnon, 2017). We assume that the area of the Piezo dome stays approximately constant independent of the conformational state of Piezo. The value of Kb for membranes with lipid compositions common to cell membranes is well documented, around 20 kBT (Rawicz et al., 2000), and values of γ relevant to living cells and required to activate Piezo have been described (Lewis and Grandl, 2015; Cox et al., 2016). Therefore, calculation of Piezo’s membrane footprint and its associated energy is a well-defined mechanics problem involving no free parameters. which appears in the analytical solution to the Euler-Lagrange equation associated with Equation 1 (Appendix 1, Equations A6 and A7). Substituting Kb=20 kBT and γ=0.1 kBT/nm2 yields λ=14 nm, which means that under these conditions Piezo’s membrane footprint is much larger than the Piezo protein itself. Membrane footprint of the Piezo dome. The shape of the Piezo membrane footprint depends on (A) the radius of curvature of the Piezo dome R, (B) the membrane bending modulus (membrane bending stiffness) Kb, and (C) the membrane tension γ. All curves show the cross section of the mid-bilayer surface and its intersection with the Piezo protein. Unless indicated otherwise, we calculated the Piezo membrane footprint using the value R=10.2 nm observed for Piezo in a closed conformation (Guo and MacKinnon, 2017) with Kb=20 kBT and γ=0.1 kBT/nm2. For Figure 1C we used the same parameter values as in the left panel of Figure 2A. The range of Kb considered in (B) corresponds to the approximate range of Kb measured for phosphatidylcholine bilayers with different acyl-chain lengths and degrees of unsaturation (Rawicz et al., 2000). Scale bars, 4 nm. The membrane footprint energy, GM, is graphed in Figure 3 as a function of Piezo’s radius of curvature. GM is greater than or equal to zero because this energy represents the work required to deform the membrane from a plane into the shape of Piezo’s membrane footprint. Figure 3A shows the energetic consequence if Piezo could undergo a conformational transition that changes its radius of curvature: a highly curved Piezo (small R) is associated with a large GM. We also see that GM is a sensitive function of membrane tension. If Piezo becomes flatter when it opens, as was proposed in the membrane dome mechanism (Guo and MacKinnon, 2017), then the deformation footprint will contribute to the energetics of gating, as shown (Figure 3B). We denote here the radii of curvature of the Piezo dome in the closed and open conformational states of Piezo by Rc and Ro, with Rc<Ro. Under finite membrane tension (γ>0) Piezo flattening (i.e., a transition from R=Rc to R=Ro) will reduce GM and thus stabilize the flatter, open conformation relative to the closed conformation. In the absence of membrane tension (γ=0) the membrane footprint is of no energetic consequence. Thus, Piezo’s membrane footprint would impose a tension-dependent bias, favoring the open conformation of Piezo only when tension is applied, and more so when tension is greater. Energy of the Piezo membrane footprint. (A) Energy cost of the Piezo membrane footprint GM as a function of the radius of curvature of the Piezo dome R. We calculated GM by minimizing Equation 1 with the membrane bending rigidity Kb=20 kBT and the indicated values of the membrane tension γ. (B) Schematic of the proposed mechanism for the mechanical activation of Piezo through membrane tension, for which we assume that the radius of curvature of the Piezo dome in the closed conformational state, Rc, takes a smaller value than in the open conformational state, Ro. 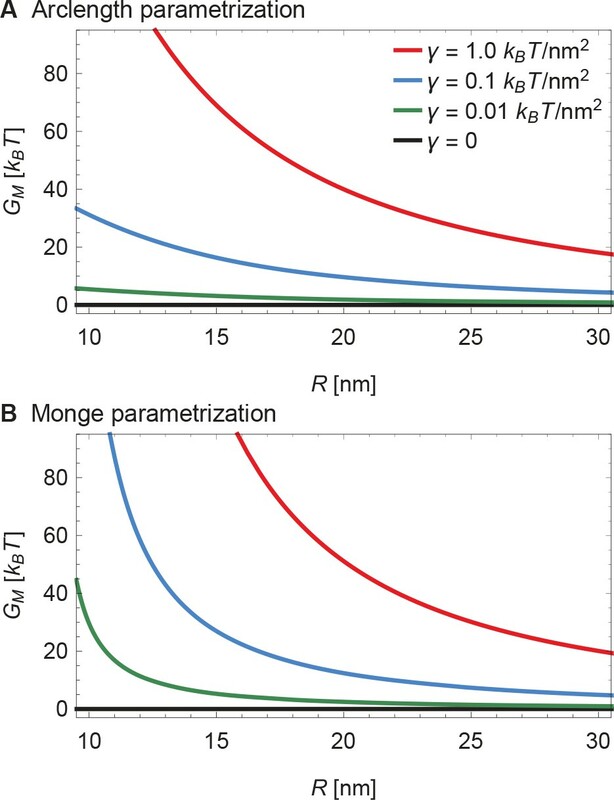 Piezo’s membrane footprint in the absence of applied tension, which is associated with GM=0, deserves a comment because the membrane is still highly curved here (see Figure 2C as γ becomes smaller). If GM represents the work required to deform the membrane from a plane into the shape of Piezo’s membrane footprint, and Piezo’s membrane footprint is curved, how can GM be zero? The explanation is that, in the limit γ→0, the membrane curves in a special way around the Piezo dome such that the principal curvatures c1 and c2 in Equation 1 sum to zero. This special surface, called a catenoid, would never truly be achieved in this physical system because thermal fluctuations will not permit zero tension and, potentially, because of deviations of the Piezo dome from a perfect spherical cap. Nevertheless, in the absence of applied tension the deformation footprint should approach the approximate shape of a catenoid. As we demonstrate below, this behavior yields fascinating consequences for Piezo’s mechanosensitivity. G is the work required to form both the Piezo dome (i.e., the curved Piezo protein and the curved membrane between the arms) and Piezo’s membrane footprint, starting from a hypothetically planar standard state. The value of GDP is unknown, GDb was estimated previously to be 2.4 π Kb (approximating all of the dome area to be occupied by lipids), and GDγ=γ ΔA with, similarly as above, ΔA being the decrease in the in-plane area of the Piezo dome compared to the planar state (Guo and MacKinnon, 2017). In addition to internal protein interactions, GDP may include a contribution to the membrane bending energy due to the Gaussian curvature of the membrane (Helfrich, 1973). 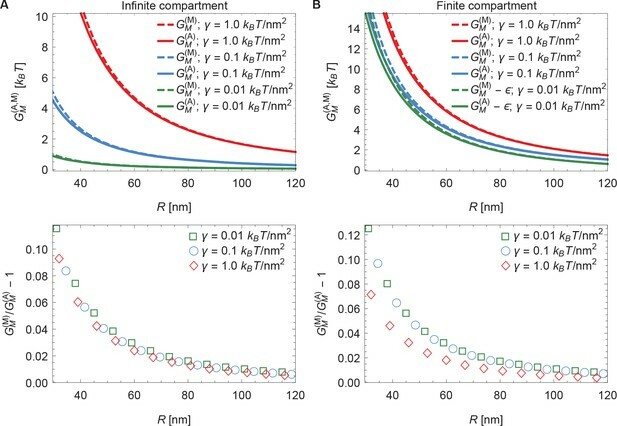 The Gauss-Bonnet theorem mandates that, for a fixed membrane topology, this contribution to GDP only depends on the boundaries of the membrane, and hence takes a constant value for a given Piezo conformational state and membrane composition (Weikl et al., 1998; Wiggins and Phillips, 2005). Now, if the dome increases its radius of curvature when Piezo opens, then the total energy difference between the open and closed conformations, ΔG, is obtained by applying Equation 3 to each conformation and taking the difference. The upper panel of Figure 4A shows this difference for the tension-dependent components of ΔG, ΔGDγ and ΔGM, for a closed to open transition if Rc=10.2 nm and Ro→∞ (i.e., Piezo being flat in the open conformation), as a function of γ. ΔGDγ and ΔGM are plotted separately for comparison. 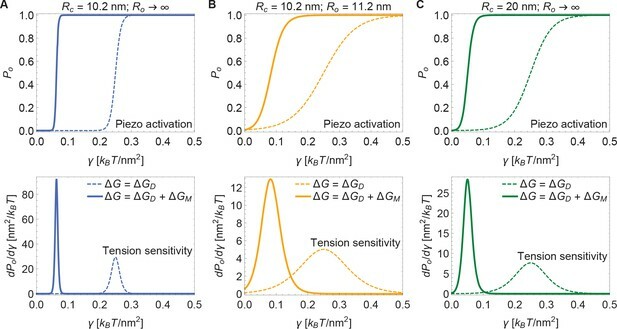 It is immediately clear that ΔGM is expected to contribute substantially to Piezo’s tension-dependent gating. Two other possible geometries, corresponding to a smaller degree of flattening (Figure 4B), or to flattening from a less curved closed state (Figure 4C), are also shown. We consider the former geometry to explore the decrease in Piezo curvature required for mechanosensitivity, and the latter geometry because the curvature of the Piezo dome may be reduced in cellular membrane environments. 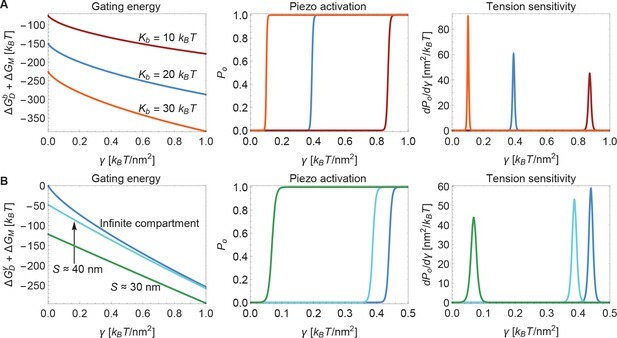 In all three cases, for tension values likely relevant to Piezo gating, the contribution to the Piezo gating energy due to Piezo’s membrane footprint is approximately equal to or greater than the tension-dependent contribution due to the Piezo dome itself. Tension-dependent contributions to the Piezo gating energy (upper panels) and associated tension sensitivity (lower panels) due to the Piezo dome, ΔGDγ, and the Piezo membrane footprint, ΔGM, as a function of membrane tension for the Piezo dome radii of curvature (A) Rc=10.2 nm and Ro→∞, (B) Rc=10.2 nm and Ro=11.2 nm, and (C) Rc=20 nm and Ro→∞ in the closed and open conformational states of Piezo, respectively. For all calculations, we set the membrane bending rigidity Kb=20 kBT. 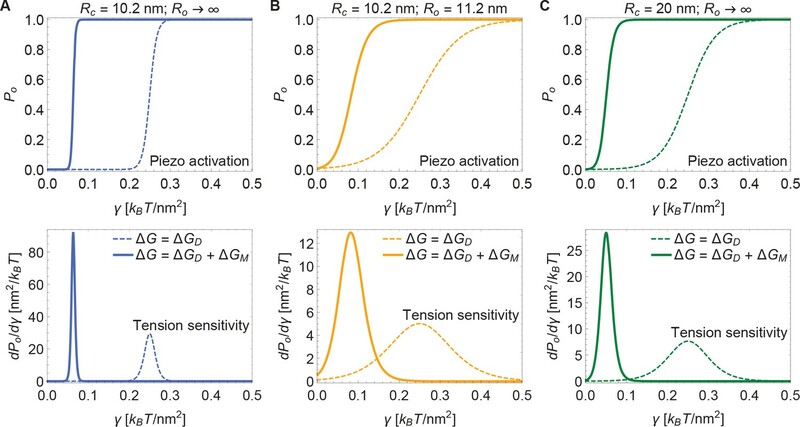 The tension sensitivity of Piezo gating depends on how steeply ΔG changes with respect to a change in γ, dΔG/dγ. We graph the predicted tension sensitivity of Piezo gating in the lower panels of Figure 4A–C, again with the contributions due to the Piezo dome and Piezo’s membrane footprint separated for comparison. The negative sign indicates that increasing γ favors the open conformation. For the dome, sensitivity is constant, equal to a constant change in ΔA. For the membrane footprint, the magnitude of the sensitivity is not constant and very large for small γ. In fact, using the analytical approach for calculating Piezo’s membrane footprint it can be shown that the tension sensitivity grows without bound as the membrane tension approaches zero. This remarkable result means that Piezo’s membrane footprint renders Piezo exquisitely sensitive in the low-tension regime; most sensitive to the smallest perturbations around zero tension. The diverging tension sensitivity as γ→0 is a consequence of the idealized catenoidal membrane footprint that is formed at zero tension. The membrane footprint is large and curved, but in a special manner. Once an incrementally small value of membrane tension is applied, this large, previously energy-free, membrane footprint is available to release in-plane area and to unbend, reducing the free energy of the expanded (open) conformation relative to the closed conformation. The unknown values of GDP were chosen so that opening occurs within the tension range shown. Since GDP is unknown, the Piezo gating tension is not a model prediction. The solid and dashed curves correspond to the gating response with and without inclusion of Piezo’s membrane footprint energy. The membrane footprint energy shifts the Po curve in the direction of smaller tension values and steepens it (i.e., increases its sensitivity). The particular gating curves shown here depend on a specific, simple gating equilibrium scheme and an unknown value of ΔGDP. Because the contribution of Piezo’s membrane footprint to the Piezo gating energy is so large, however, the conclusion that the position and steepness of the Po curve should exhibit a strong dependence on Piezo’s membrane footprint will apply to a wide range of possible gating schemes. Piezo activation through membrane tension. Piezo activation curves Po (upper panels) and associated tension sensitivity (lower panels) resulting solely from the gating energy due to the Piezo dome, ΔG=ΔGD, and from the gating energy due to the Piezo dome together with the Piezo membrane footprint, ΔG=ΔGD+ΔGM, as a function of membrane tension for the Piezo dome radii of curvature (A) Rc=10.2 nm and Ro→∞, (B) Rc=10.2 nm and Ro=11.2 nm, and (C) Rc=20 nm and Ro→∞ in the closed and open conformational states of Piezo, respectively. For all calculations, we set the membrane bending rigidity Kb=20 kBT. We used the values (A) ΔGDP≈180 kBT, (B) ΔGDP≈31 kBT, and (C) ΔGDP≈47 kBT for the (unknown) contribution of the protein energy to the Piezo gating energy such that gating occurs within the indicated tension range. Next, we consider the influence of membrane bending stiffness on Piezo gating. We quantify the magnitude of the membrane bending stiffness by the membrane bending modulus Kb. We are interested in this dependence because membrane bending stiffness is a function of lipid composition, which could vary among different cell types and possibly even between different regions within the same cell. To what extent might membrane bending stiffness influence Piezo’s response to membrane tension? Membrane bending stiffness enters the Piezo gating energy through the dome contribution ΔGDb and the footprint contribution ΔGM. Figure 6A shows the sum of these two membrane bending stiffness-dependent contributions to the Piezo gating energy and associated Po and sensitivity curves for three different values of Kb. Note that ΔGDb contributes as a tension-independent constant, whereas the contribution ΔGM depends on membrane tension. Together, ΔGDb and ΔGM contribute significantly to ΔG and thus to gating. This implies that Piezo channels in different cell types and possibly different locations within a cell will exhibit different gating characteristics. Modulation of Piezo gating through the membrane. (A) Membrane bending stiffness-dependent contribution to the Piezo gating energy ΔGDb+ΔGM (left panel) and associated Piezo activation and tension sensitivity curves (middle and right panels) as a function of membrane tension for the indicated values of the membrane bending stiffness Kb. 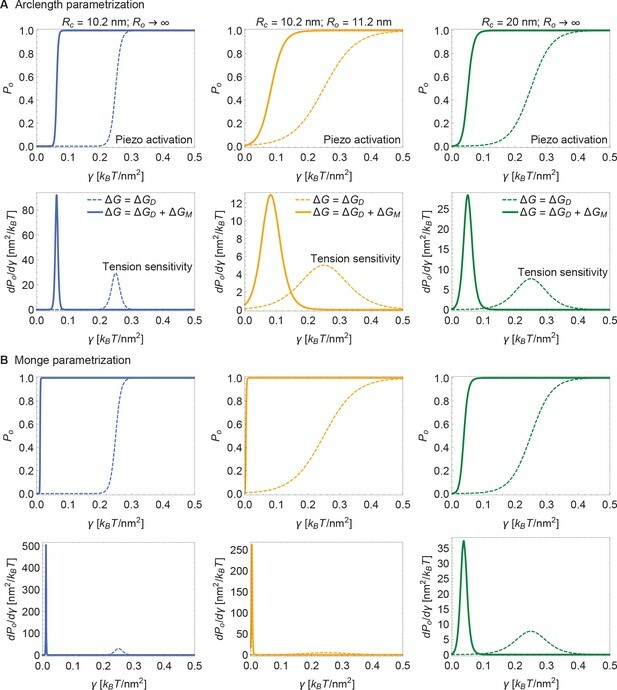 (B) Membrane tension-dependent contribution to the Piezo gating energy ΔGDγ+ΔGM (left panel) and associated Piezo activation and tension sensitivity curves (middle and right panels) as a function of membrane tension for infinite and finite membrane compartments. For both (A) and (B) we employed the Piezo dome radii of curvature Rc=10.2 nm and Ro→∞ in the closed and open conformational states of Piezo, respectively. For (B) we used the unconstrained membrane arc lengths 5 nm and 10 nm separating the border of the Piezo dome and the border of the membrane compartment along the membrane in the radial direction, which correspond to the membrane compartment diameters S ≈30 nm and S ≈40 nm, respectively, and set Kb=20 kBT. We calculated the curves in the middle and right panels of (A) and (B) from the total energy of the membrane-Piezo system in Equation 3, with the values (A) ΔGDP≈270 kBT and (B) ΔGDP≈280 kBT for the (unknown) contribution of the protein energy to the Piezo gating energy such that gating occurs within the indicated tension ranges. The membrane footprint induced by Piezo is expected to influence the distribution of molecules – both lipids and proteins – in the surrounding membrane. Piezo’s membrane footprint should attract lipids and proteins that exhibit an energetic preference for the curved shape of the membrane footprint, and repel molecules that ‘prefer’ other membrane shapes. 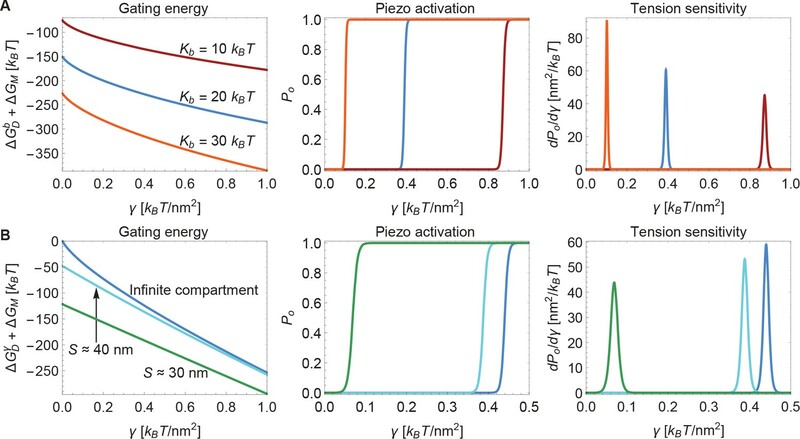 Conversely, our model of Piezo’s membrane footprint implies that the composition of the surrounding membrane should influence the energetics of Piezo gating. This model prediction raises interesting possibilities for the regulation of Piezo gating in different membrane environments. The membrane footprint induced by Piezo also implies that Piezo channels should interact with each other through the membrane, and hence influence each other’s local distribution in the membrane and gating properties. Finally, we consider the effect of membrane compartment size on Piezo gating. In the calculations presented so far Piezo was assumed to reside in an infinite membrane that approaches a planar configuration far from the channel. But real cell membranes are compartmentalized. For example, cytoskeletal attachments, which occur at spatial frequencies of up to tens of nanometers, can restrict the shapes a membrane can take (Kusumi et al., 2014). Figure 6B shows the sum of the tension-dependent contributions to the Piezo gating energy, ΔGDγ and ΔGM, and associated Po and sensitivity curves, for different compartmental restrictions. Membrane compartments with diameters S approximately equal to 30nm and 40nm are compared to an infinite membrane. These compartments restrict the distance between Piezo’s outer perimeter and the edge of the membrane compartment to distances of 5nm and 10nm along the membrane in the radial direction, respectively. In general, the effects of membrane compartmentalization are greater in the low-tension regime. This result can be understood in terms of the characteristic decay length of membrane shape deformations in Equation 2: larger values of γ reduce the size of Piezo’s membrane footprint so that it fits better into the membrane compartment. We also note that the smaller the membrane compartment, the greater influence it has on Piezo gating. This is because in these particular calculations the membrane is constrained to planarity at the edge of the membrane compartment, but the effect will in general also depend on the membrane slope constraint at the edge of the membrane compartment. The important point is that membrane compartmentalization can have a large effect on Piezo gating because membrane compartments can alter the shape and therefore the energy of Piezo’s membrane footprint. Experimentally observed effects of cytoskeletal removal on some properties of Piezo gating could reflect the importance of Piezo’s membrane footprint for Piezo gating (Cox et al., 2016). In Figure 6 we neglected the contribution to the membrane bending energy due to the Gaussian curvature of the membrane (Helfrich, 1973). While being independent of the shape of the membrane footprint, the Gaussian contribution to the membrane bending energy depends on the membrane composition and on how the membrane is constrained at the Piezo and membrane compartment boundaries (Weikl et al., 1998; Wiggins and Phillips, 2005). Contributions to the membrane bending energy due to the Gaussian membrane curvature may therefore further modulate Piezo gating in compartmentalized membranes with heterogeneous lipid compositions. While Piezo channels can exhibit complex gating properties, including inactivation and voltage dependence, their dominant functional characteristic is that they open in response to mechanical force (Coste et al., 2010; Lewis and Grandl, 2015). This paper analyzes the influence of Piezo’s unusual dome shape on the lipid bilayer membrane that surrounds the channel. The results depend on three key properties of the membrane-Piezo system and they are known: Piezo’s shape, the lipid bilayer bending modulus, and the levels of tension that can be applied to a lipid membrane. Finding the shape of the lipid membrane surrounding Piezo, and its associated energy, amounts to solving a simple mechanics problem. And the inescapable conclusion is that Piezo, owing to its unusual shape, imposes a large structural perturbation – a deformation called a membrane footprint – on its surrounding membrane. Depending on the applied membrane tension, Piezo’s membrane footprint can come with a large energetic cost. Consequently, if Piezo changes its shape, for example if it becomes flatter upon opening, then the surrounding membrane will weigh in prominently in an energetic sense to Piezo’s tension sensitivity. Moreover, Piezo’s membrane footprint weighs in in such a way that the tension sensitivity of Piezo gating is greatest in the low-tension regime. This property would seem to render Piezo poised to respond to the slightest changes in cell membrane tension. In our analysis of Piezo’s membrane footprint we used a spherical dome shape to approximate a more complex underlying geometry of Piezo. Deviations from a spherical dome shape will alter the shape and energetics of the membrane footprint. But the basic idea that Piezo’s curved shape will create an energetically important membrane footprint will still apply. Piezo’s large membrane footprint rationalizes what at first seemed to be a contradiction in the experimental literature. Certain data show the clear importance of the membrane in mediating Piezo’s mechanosensitivity (Lewis and Grandl, 2015; Syeda et al., 2016; Cox et al., 2016), while other data show the importance of tether attachments (e.g., the cytoskeleton) to the channel or the membrane (Cox et al., 2016; Wu et al., 2016). A large membrane footprint essentially demands that both contributions be energetically important. Piezo is a very uniquely shaped membrane protein. We think that this shape evolved specifically to exploit the physical properties of the lipid membrane to create a large membrane footprint, enabling exquisite tension sensitivity. We used Equation 1 to analytically and numerically calculate Piezo’s membrane footprint, and its associated energy, through the Monge (Weikl et al., 1998; Turner and Sens, 2004; Wiggins and Phillips, 2005; Li et al., 2017) and arclength (Peterson, 1985; Seifert et al., 1991; Deserno, 2004; Bahrami et al., 2016) parametrizations of surfaces, respectively. Appendix 1-sections 1 and 2 provide a detailed discussion of these Monge and arclength solutions. All of the results shown in the main text figures were calculated numerically using the arclength parametrization of surfaces, which allows for large membrane curvatures. In Appendix 1-section 3 we compare the analytical and numerical solutions obtained using the Monge and arclength parametrizations of surfaces. 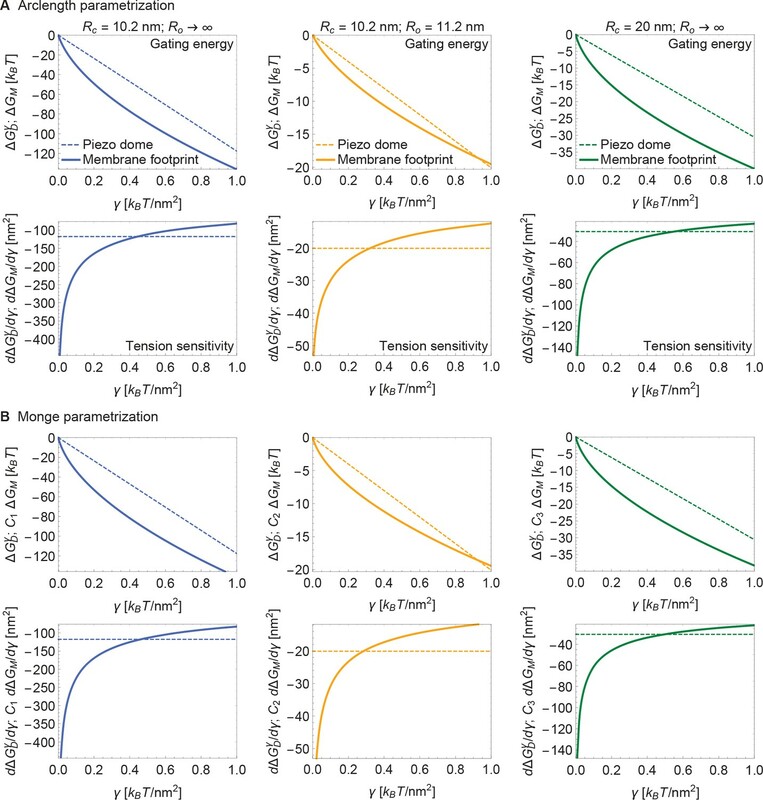 We find that the Monge parametrization of surfaces tends to overestimate the magnitudes of Piezo’s membrane footprint and its associated membrane deformation energy but yields, for the scenarios considered in the main text figures, qualitatively similar predictions as the arclength parameterization of surfaces. We provide here a detailed description of the mathematical methods we used for the calculation of the membrane footprint (see Appendix 1—figure 1), and associated membrane deformation energy, of the Piezo dome. As explained in the main text, we calculated the membrane footprint of the Piezo dome by finding the stationary membrane shapes associated with the classic Helfrich energy. where the integral runs over the membrane surface surrounding the Piezo dome, c1and c2 are the local principal curvatures of the membrane surface, Kb is the lipid bilayer bending modulus, γ is the membrane tension, and Δ⁢A is the decrease in in-plane area due to the membrane shape deformations induced by the Piezo dome (see also Equation 1 of the main text). (A given stationary membrane shape may, in principle, be unstable to small perturbations, and hence may not be physically relevant (Peterson, 1985; Seifert et al., 1991; Seifert, 1997). Here, we only found one stationary membrane shape for each scenario considered, and therefore identified this stationary membrane shape with Piezo’s membrane footprint. The functions which make a given functional such as in Equation A1 stationary are referred to as the extremal functions of this functional (Courant and Hilbert, 1953).) For a given radius of curvature of the Piezo dome, R, we obtained the energy cost of Piezo’s membrane footprint by substituting the corresponding stationary membrane shape implied by Equation A1 back into Equation A1 and evaluating the surface integral. 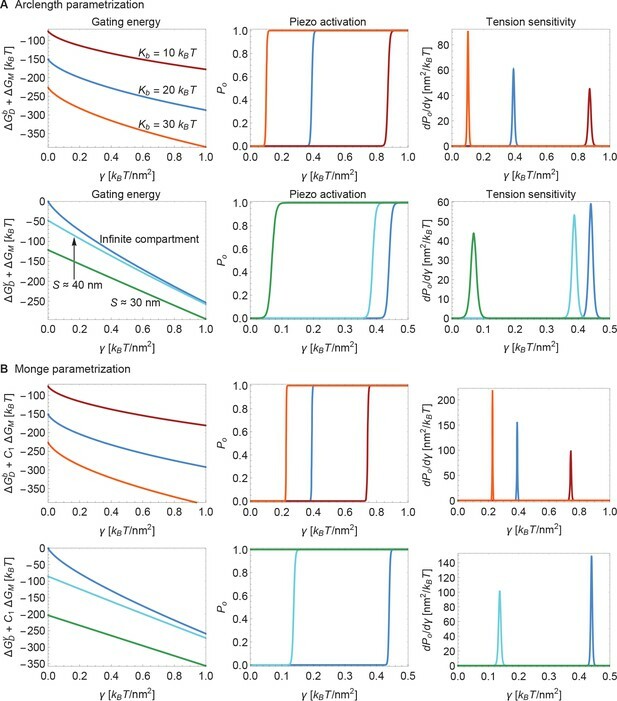 We obtained the stationary membrane shapes associated with Equation A1, and calculated the corresponding energy cost of Piezo’s membrane footprint, using two complementary mathematical approaches. On the one hand, we used the Monge parametrization of surfaces to derive exact analytical solutions of the stationary Piezo membrane footprints implied by Equation A1, and then used Equation A1 to determine the corresponding exact analytic expressions for GM (Weikl et al., 1998; Turner and Sens, 2004; Wiggins and Phillips, 2005; Ursell et al., 2008; Auth and Gompper, 2009; Sabass and Stone, 2016; Li et al., 2017) (see Appendix 1-section 1). The Monge parametrization of surfaces is only expected to yield quantitatively accurate results for the stationary membrane shapes implied by Equation A1 in the limit of small membrane shape deformations. We therefore used, on the other hand, the arclength parametrization of surfaces, which can capture arbitrarily large membrane shape deformations, to numerically solve for the membrane footprint of the Piezo dome and the corresponding GM (Peterson, 1985; Seifert et al., 1991; Jülicher and Seifert, 1994; Deserno, 2004; Bahrami et al., 2016) (see Appendix 1-section 2). Our calculations show that, for the radius of curvature R=10.2nm measured previously for a closed state of Piezo (Guo and MacKinnon, 2017), the Piezo-induced membrane shape deformations are pronounced enough so that the Monge parametrization of Equation A1 does not yield quantitatively accurate results. We find, however, that on a qualitative level the Monge and arclength parametrizations of Equation A1 yield similar predictions for the mechanical gating of Piezo (see Appendix 1-section 3). All of the results shown in the main text were obtained using the arclength parametrization of Equation A1. Cross section of the membrane shape deformations induced by Piezo for Kb=20kBT and γ=0.1kBT/nm2. Based on the structural data in (Guo and MacKinnon, 2017) we assume that the Piezo dome takes the shape of a spherical cap with fixed cap area Scap=0.3×4π×10.22nm2≈390nm2. We denote the radius of curvature of the Piezo dome by R, and represent the central pore axis of Piezo by the h-axis and the radial coordinate in the reference plane by r. Furthermore, we denote the arclength along the profile of Piezo’s membrane footprint by s, with s=0 at the interface of the Piezo dome and the surrounding membrane and s>0 away from the Piezo dome. We set R=10.2 nm (Guo and MacKinnon, 2017) here and obtained Piezo’s membrane footprint by numerically calculating the stationary membrane shape implied by the arclength parametrization of Equation A1 (Peterson, 1985; Seifert et al., 1991; Jülicher and Seifert, 1994; Deserno, 2004; Bahrami et al., 2016) (see Appendix 1-section 2). The quantities R and Scap mathematically determine (Weisstein, 2017) the in-plane radius of the Piezo dome, r=ri, and the cap angle, α. We allowed here the Piezo-induced membrane shape deformations to decay to a flat membrane shape over an arbitrarily large s.
in polar coordinates. The Piezo membrane deformation profile h⁢(r) is obtained by finding, subject to suitable boundary conditions on h⁢(r), the stationary membrane profile implied by Equation A2, from which the corresponding membrane deformation energy can be calculated via Equation A2. The Monge parametrization of Equation A1, expressed in Equation A2, has the advantage that it provides simple analytic expressions for the membrane deformation energy associated with arbitrary conformational states of Piezo. We note that, as far as the membrane footprint of the Piezo dome is concerned, Piezo can effectively be regarded as a conical membrane inclusion of radius ri and opening angle 2⁢α (Weikl et al., 1998; Turner and Sens, 2004; Wiggins and Phillips, 2005; Ursell et al., 2008; Auth and Gompper, 2009; Sabass and Stone, 2016; Li et al., 2017). where I0 and K0 are the zeroth-order modified Bessel functions of the first and second kind, and the constants A0, B0, C0, and D0 must be fixed through the boundary conditions on h⁢(r) at r=ri and/or r=rm. where we use here the value b=0 corresponding to a flat membrane at the membrane compartment boundary. The boundary condition in Equation A11 mathematically expresses the assumption that the membrane compartment boundary imposes a given (flat) membrane shape far enough away from Piezo. we would have obtained identical expressions for A0, B0, and D0 in Equations A12–A15, but C0 would be shifted so as to account for this redefinition of the (arbitrary) height of the membrane surface relative to the reference plane. Note that Equations A19 and A20 only depend on the particular solutions in Equation A7 containing Bessel functions. These solutions are independent of the coefficient C0 in Equation A7, and we would have obtained expressions identical to those in Equations A19 and A20 if, instead of Equations A8 and A10, we had imposed the boundary conditions in Equations A17 and A18. This result can be understood by noting that the energy in Equation A2 only depends on h through derivatives of h, and hence does not depend on the absolute value of h.
In agreement with previous studies (Deserno, 2004; Auth and Gompper, 2009), Equations A25 and A26 show that, for a membrane that is asymptotically flat, the energy cost of Piezo’s membrane footprint vanishes for γ=0, with the membrane taking the shape of a minimal (catenoidal) surface. While this result followed from the Monge parametrization of Equation A1 (i.e., in the limit of small membrane shape deformations), the arclength parametrization of Equation A1 (see Appendix 1-section 2), which is valid for arbitrarily large membrane shape deformations, also yields for γ=0 and asymptotically flat lipid membranes minimal (catenoidal) lipid bilayer deformations with zero bending energy (Deserno, 2004). The arclength parametrization of surfaces provides an elegant approach for the representation of axisymmetric shapes with, potentially, large gradients, and thus complements the Monge parametrization considered in Appendix 1-section 1. In the arclength parametrization, the Euler-Lagrange (Lagrange) equations associated with Equation A1 are, in general, highly nonlinear (Peterson, 1985; Seifert et al., 1991; Jülicher and Seifert, 1994) and must be solved numerically. The arclength parametrization of lipid membrane surfaces has allowed the systematic determination of the minimum energy shapes of axisymmetric lipid bilayer vesicles (Peterson, 1985; Seifert et al., 1991; Jülicher and Seifert, 1994; Seifert, 1997), and has been used to study the wrapping of spherical and cylindrical colloids by lipid bilayers (Deserno and Bickel, 2003; Deserno, 2004; Hashemi et al., 2014), endocytosis (Nowak and Chou, 2008; Bahrami et al., 2016; Agudo-Canalejo and Lipowsky, 2016), and the self-assembly of protein coats on lipid bilayer membranes (Zhang and Nguyen, 2008; Foret, 2014). subject to the geometric constraints in Equations A27 and A28, where, for simplicity, we have dropped the subscript 'M' in Equation A1, we have set s=0 at the boundary of the Piezo dome and the surrounding membrane, s>0 away from the Piezo dome, and s0→∞ for an infinite membrane. The terms ψ˙ and sin⁡ψ/r in Equation A29 are the two principal curvatures of the membrane in the arclength parametrization (the term sin⁡ψ/r can be rationalized by noting that the planes associated with the two principal curvatures must be perpendicular to each other, and the radius of curvature =r/sin⁡ψ in the plane perpendicular to the r-h plane in Appendix 1—figure 1), while the term r⁢cos⁡ψ yields the in-plane area of Piezo’s membrane footprint (this can be seen by noting from Equation A27 that cos⁡ψ=d⁢r/d⁢s), with the undeformed reference state of the membrane corresponding to a flat membrane with ψ=0. in which the Lagrange parameter functions λr⁢(s) and λh⁢(s) must be chosen such that the constraints in Equations A27 and A28 are satisfied by the extremal functions associated with Equation A30. The integrand L in Equation A30 is analogous to the Lagrangian function in classical dynamics (Kibble and Berkshire, 2004), with the arclength s being the analogue of the time coordinate in classical dynamics. The solutions of Equations A39–A44 specify the stationary shapes of Piezo’s membrane footprint implied by Equation A29, from which the corresponding membrane deformation energy can be calculated (numerically) via Equation A29 or via Equation A30. where we use here the values β=0 and 𝒞=0 corresponding to a flat membrane surface far enough away from Piezo. where we have used Equation A37 with Equations A33, A45, and A50, and ψ˙⁢(0) is unknown. Note that, for a given set of values of r⁢(0), ψ⁢(0), and ψ˙⁢(0), the generalized momentum pψ in Equation A33 is completely determined at s=0. Since Equations A39–A44 are a set of first-order (coupled) ordinary differential equations, their solution is fixed by the ‘initial’ conditions ψ⁢(0), r⁢(0), h⁢(0), pψ⁢(0), pr⁢(0), and ph⁢(0), with the only unknown being ψ˙⁢(0). A practical strategy for obtaining Piezo’s membrane footprint through numerical solution of Equations A39–A44 is therefore to generate a set of solutions corresponding to different values of ψ˙⁢(0) and to select, among these solutions, the specific solution(s) satisfying Equations A51 and A52 up to some numerical accuracy. Such a ‘shooting’ method (Burden and Faires, 2011; Gautschi, 2012) has been employed widely for numerically finding the stationary shapes implied by the arclength parametrization of Equation A1 (Peterson, 1985; Seifert et al., 1991; Jülicher and Seifert, 1994; Seifert, 1997; Deserno and Bickel, 2003; Deserno, 2004; Nowak and Chou, 2008; Zhang and Nguyen, 2008; Foret, 2014; Hashemi et al., 2014; Agudo-Canalejo and Lipowsky, 2016; Bahrami et al., 2016), and we used the same approach here. For completeness, we outline here the basic procedure for the solution of Equations A39–A44 through the shooting method (Deserno and Bickel, 2003; Deserno, 2004; Nowak and Chou, 2008; Zhang and Nguyen, 2008; Hashemi et al., 2014; Foret, 2014). First, based on intuition gained from numerical experimentation, we chose a range of suitable ψ˙⁢(0). More automated approaches for choosing ψ˙⁢(0) are also available (Burden and Faires, 2011; Gautschi, 2012). Note that, to achieve a flat membrane profile far enough away from Piezo, we generally expect that ψ˙(0)<0. For the scenarios considered here we have that −0.4<ψ˙(0)<0. Second, we solved Equations A39–A44 subject to the initial conditions ψ⁢(0), r⁢(0), h⁢(0), pψ⁢(0), and pr⁢(0) described above with ph=0 using standard numerical solvers of ordinary differential equations (Wolfram Research, Inc., 2017) up to some large (but necessarily finite) maximum value of the arclength. For each of these solutions, we numerically determined the smallest value of s for which Equations A51 and A52 are satisfied. (In practice, we only considered here Equation A51 (Deserno, 2004).) For scenarios in which we assume that Equations A51 and A52 hold only asymptotically for s→∞, we identified this value of s with s0 (Deserno, 2004), and selected among all the solutions corresponding to different ψ˙⁢(0) the solution with the largest value of s0. (It is assumed here that the exact solutions of Equations A39–A44 do not oscillate about the boundary conditions in Equations A51 and A52.) For scenarios in which we assume that membrane compartmentalization favors solutions with a given value s0=sm, we selected the solution with the smallest magnitude of ψ⁢(sm), and confirmed for this solution that sm approximately corresponds to the smallest value of s for which Equation A51 is satisfied. (Again, it is assumed here that the exact solutions of Equations A39–A44 do not oscillate about the boundary conditions in Equation A51 and A52.) The resulting solutions of Equations A39–A44 specify the shape of the membrane footprint of the Piezo dome, from which we obtained the corresponding energy cost of Piezo-induced membrane shape deformations by numerically evaluating Equation A30 over the integration domain 0≤s≤s0 (Wolfram Research, Inc., 2017). We tested this numerical solution procedure (Deserno and Bickel, 2003; Deserno, 2004; Nowak and Chou, 2008; Zhang and Nguyen, 2008; Hashemi et al., 2014; Foret, 2014) for Piezo’s membrane footprint by comparing the membrane deformation energies implied by the Monge and arclength parameterizations of Equation A1 (see Appendix 1-section 3). To check the numerical solution procedure described in Appendix 1-section 2 it is useful to compare numerical solutions obtained using the arclength parametrization of Equation A1 with the corresponding exact analytical solutions obtained in Appendix 1-section 1 using the Monge parametrization of Equation A1 (see Appendix 1—figure 2). For infinite (see Appendix 1—figure 2A) as well as finite (see Appendix 1—figure 2B) membrane compartment sizes, which we specify in terms of the arclength sm such that 0≤s≤sm, we find that the numerical solutions obtained in the arclength parametrization of Equation A1 agree with the corresponding analytical solutions obtained in the Monge parametrization of Equation A1 for small enough membrane shape deformations (large enough R). In the case of infinite membrane compartments, the decrease in the relative difference of the analytical and numerical solutions with increasing R, shown in the lower panel of Appendix 1—figure 2A, is consistent with previous results (Deserno and Bickel, 2003). In the case of finite membrane compartments we find, in Appendix 1—figure 2B, a similar convergence of analytical and numerical results with increasing R, with a particularly small relative difference of the analytical and numerical solutions for γ=1.0kBT/nm2. This can be rationalized by noting that, for γ=1.0kBT/nm2 with Kb=20kBT, the characteristic decay length of Piezo-induced membrane shape deformations, λ=Kb/γ≈4.5 nm, is of a comparable magnitude as the membrane compartment size sm=5 nm used in Appendix 1—figure 2B. In Appendix 1—figure 2B, as well as the main text, we implemented finite membrane compartments by fixing the value of the maximum arclength sm such that 0≤s≤sm and imposing a flat membrane shape at the membrane compartment boundary. There are other ways of implementing finite membrane compartments in our physical model of the mechanical gating of Piezo. In particular, one may define the membrane compartment as having a fixed surface area, a fixed in-plane area, a fixed in-plane radius, or a fixed arclength. Furthermore, the boundary of the membrane compartment may locally impose different membrane shapes. To illustrate how a finite membrane compartment size can affect the mechanical gating of Piezo, we focused here on the particularly straightforward case of membrane compartments with a fixed arclength around the Piezo dome and a flat membrane shape at the membrane compartment boundary. Membrane compartments with other properties would yield different results. For instance, if the membrane shape at the membrane compartment boundary was chosen so as to locally match the shape of the corresponding solution obtained for an asymptotically flat, infinite membrane, a finite membrane compartment would yield, for γ>0, an energy cost of Piezo’s membrane footprint that is decreased compared to the associated energy cost of Piezo’s membrane footprint for an asymptotically flat, infinite membrane. In contrast, we find in the main text (and also Appendix 1—figure 2) that, for a flat membrane shape at the membrane compartment boundary, the energy cost of Piezo’s membrane footprint is increased in a finite membrane compartment compared to an asymptotically flat, infinite membrane. Comparison of arclength and Monge solutions. Energy cost of Piezo’s membrane footprint GM as a function of the radius of curvature of the Piezo dome R calculated numerically using the arclength parametrization of Equation A1 (see Appendix 1-section 2) [GM(A)] and analytically using the Monge parametrization of Equation A1 (see Appendix 1-section 1) [GM(M)] (upper panels), and corresponding relative difference of the analytical and numerical solutions (lower panels), for (A) infinite and (B) finite membrane compartments. We set Kb=20kBT and Scap=0.3×4π×10.22nm2≈390nm2 (Guo and MacKinnon, 2017), and used the indicated values of the membrane tension. For (B) we used an unconstrained membrane arclength sm=5nm separating the boundary of the Piezo dome and the boundary of the membrane compartment along the membrane in the radial direction. For ease of visualization, we shifted the curves corresponding to γ=0.01kBT/nm2 by ϵ=0.4kBT in the upper panel of (B). The Monge parametrization of Equation A1 fails to give quantitatively accurate results for the large membrane shape deformations implied by the observed Piezo dome structure with R≈10.2nm (Guo and MacKinnon, 2017) (see Appendix 1—figures 3–7). In particular, the Monge parametrization of Equation A1 overestimates the magnitude of the membrane shape deformations induced by the Piezo dome (Appendix 1—figure 3). Furthermore, the Monge parametrization of Equation A1 yields contributions to the Piezo gating energy due to Piezo’s membrane footprint, Δ⁢GM, that are too large by a factor of approximately 4/3 to 12 depending on the specific scenario considered (Appendix 1—figures 5 and 7). However, we also find that the Monge parametrization of Equation A1 gives the same qualitative results as the arclength parametrization of Equation A1 for the scenarios considered in the main text (Appendix 1—figures 3–7). Supplement to membrane footprint of the Piezo dome. (A) Same plots as in Figures 1C and 2 of the main text, with the membrane footprints calculated numerically using the arclength parametrization of Equation A1 (see Appendix 1-section 2) and (B) corresponding results with the membrane footprints calculated analytically using the Monge parametrization of Equation A1 (see Appendix 1-section 1). We use the same labeling conventions for (A) and (B). Scale bars, 4 nm. See Figures 1C and 2 of the main text for further details. Supplement to energy of the Piezo membrane footprint. (A) Same plots as in Figure 3A of the main text, with GM calculated numerically using the arclength parametrization of Equation A1 (see Appendix 1-section 2) and (B) corresponding results with GM calculated analytically using the Monge parametrization of Equation A1 (see Appendix 1-section 1). We use the same labeling conventions for (A) and (B). See Figure 3A of the main text for further details. Supplement to energy of Piezo gating. (A) Same plots as in Figure 4 of the main text, with Δ⁢GM calculated numerically using the arclength parametrization of Equation A1 (see Appendix 1-section 2) and (B) corresponding results with Δ⁢GM calculated analytically using the Monge parametrization of Equation A1 (see Appendix 1-section 1). We use the same labeling conventions for (A) and (B). For ease of visualization, we rescaled Δ⁢GM by C1=1/4, C2=1/12, or C3=3/4 in (B) (left to right panels). See Figure 4 of the main text for further details. Supplement to Piezo activation through membrane tension. (A) Same plots as in Figure 5 of the main text, with Δ⁢GM calculated numerically using the arclength parametrization of Equation A1 (see Appendix 1-section 2) and (B) corresponding results with Δ⁢GM calculated analytically using the Monge parametrization of Equation A1 (see Appendix 1-section 1). We employed the same values of Δ⁢GDP, and use the same labeling conventions, for (A) and (B). See Figure 5 of the main text for further details. Supplement to modulation of Piezo gating through the membrane. (A) Same plots as in Figure 6 of the main text, with Δ⁢GM calculated numerically using the arclength parametrization of Equation A1 (see Appendix 1-section 2) and (B) corresponding results with Δ⁢GM calculated analytically using the Monge parametrization of Equation A1 (see Appendix 1-section 1). We use the same labeling conventions for (A) and (B). For ease of visualization, we rescaled Δ⁢GM by C1=1/4 in the left panels of (B). For (B) we set ΔGDP≈520kBT (upper middle and upper right panels) and ΔGDP≈550kBT (lower middle and lower right panels) for the (unknown) contribution of the protein energy to the Piezo gating energy such that gating occurs within the indicated tension ranges. See Figure 6 of the main text for further details. New York: Interscience Publishers, Inc.
European Physical Journal E 37:42. New York: Dover Publications, Inc.
New York: Springer Science & Business Media. Journal of the Royal Society Interface 11:20140769. Zeitschrift für Naturforschung C 28:693–703. Journal of Applied Physics 57:1739–1742. Journal of General Physiology 113:525–540. Pflügers Archiv - European Journal of Physiology 467:27–37. 37–70, Role of lipid bilayer mechanics in mechanosensation, Mechanosensitive Ion Channels, Springer. From MathWorld – A Wolfram Web Resource. Accessed November 29, 2018. Wolfram Research, Inc, Champaign, IL. Thank you for submitting your article "Piezo's membrane footprint and its contribution to mechanosensitivity" for consideration by eLife. Your article has been reviewed by three peer reviewers, and the evaluation has been overseen by a Reviewing Editor and Richard Aldrich as the Senior Editor. The following individuals involved in review of your submission have agreed to reveal their identity: Ardem Patapoutian (Reviewer #1); Olaf S Andersen (Reviewer #2). This study explores the physical basis of mechanosensitivity of Piezo1 ion channels. Structural studies have shown that Piezo1 channels have a unique curved shape in detergent micelles. This curved architecture is largely retained in liposomes/lipid membranes such that the lipid membranes are significantly deformed upon incorporation of Piezo1 channels. This paper examines the importance of this membrane deformation on the overall gating and mechanosensitivity of the Piezo1 channels from an analytical standpoint. 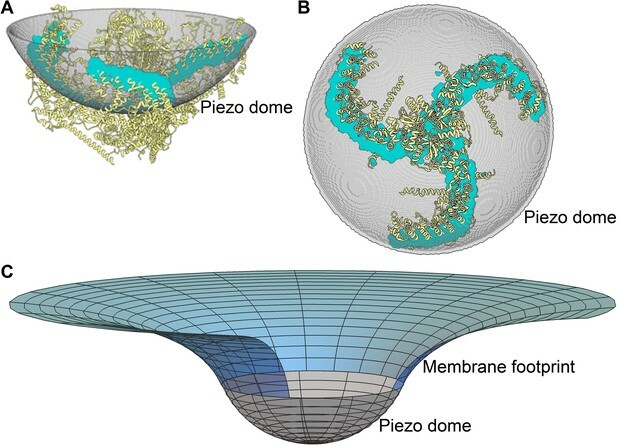 The overall conclusion is that Piezo, owing to its unusual shape, imposes a large structural perturbation (which the authors refer to as membrane footprint) on its surrounding membrane. This membrane footprint weighs such that the tension sensitivity of Piezo gating is greatest in the low-tension regime rendering Piezo poised to respond to the slightest changes in cell membrane tension. The authors' treatment of mechanosensitivity is elegant – it eschews details such as "structural domains" and "conformational changes" and yet is able to incorporate structural information to offer mechanistic insight into how Piezo channels work. 1) As the authors note, only partial molecular structures of Piezo have been determined. 12 predicted TM helices per promoter are conspicuously absent, which could contribute significantly to the shape of Piezo. Do the authors think the additional TMs extend the Piezo "dome" or are they part of the membrane footprint? How might the additional TMs affect the parameters in the mechanical calculations? 2) The authors only consider a single aspect observed in the Piezo structure – its unique curvature – in constructing and describing the model of mechanosensitivity. In the context of the dome/membrane footprint gating models, what other aspects of the structure could be important? For example, as seen in Figure 1B, the "arms" of Piezo are "tucked" inward, creating a relatively compact triskelion. Might the three armed architecture afford the ability of Piezo to "curl" outward in an expanded/open state? 3) What would be the curvature of Piezo1, in the open state, which would enable it to be sensitive to mechanical stimuli? This might allow one to rationalize the pretty large (~47kT) energy difference between open and closed states (used for many of the simulations) presented. 4) Would the authors predict that Piezo1 is osmosensitive as well? Change in osmotic pressure would change the intrinsic curvature of the membrane and thus the membrane deformation energy which according to the authors' model would affect gating and mechanosensitivity of the channel. To the best of my knowledge, Piezo1 channels show very little osmosensitivity. It might serve the paper if the authors briefly discuss the different modes of mechanosensitivity (osmosensitive, shear-sensitive, mechano- or stretch sensitive, etc.) and how their model relates to Piezo1's unique mode of mechanical response. Throughout the paper the authors consider the Piezo-membrane system as consisting of a single Piezo trimer and its surrounding membrane, and that the "membrane footprint" of Piezo can extend tens of nanometers beyond the actual surface area occupied by the protein. But cellular membranes are highly heterogenous and is occupied by many membrane proteins, some of which may interact with Piezo and modulate function. It seems that the deformed membrane surrounding Piezo would be energetically unfavorable to be occupied by other membrane proteins, at least those that prefer planar membranes. A further consequence of the membrane footprint model is that two neighboring Piezo molecules would repel each other to prevent overlap of deformation footprints (Philips, Ursell et al., Nature 2009). Can the authors discuss how the membrane footprint might effect interaction of Piezos with other membrane proteins, and whether their model precludes the formation of Piezo clustering (a behavior seen in various other ion channel families)? The final question which I have is whether the authors think that if their proposed mechanism is 'correct' and the membrane deformation energy is a crucial component of gating energetics, would there be interchannel cooperativity – i.e. cooperativity between (two or more) neighboring channels? The authors describe the membrane footprint of a single channel and how it relates to its gating. However, if there are two or more channels in the vicinity, then the overall membrane footprint of the multiple channels might (and in all likelihood will) be different from the sum of individual channels and therefore the energetics and mechanosensitivity would also be different. Furthermore, the nature of the membrane (intrinsic curvature and composition) would also in likelihood affect such cooperativity. I would think that this is an important point and wonder what the authors think about it. It might be worthwhile to discuss this aspect, even if briefly. The presence of the additional TMs would make the arms longer and the area of Piezo larger. However, because the first 12 helices corresponding to the first 3 domains are not visualized in any of the structures that have been solved, we suspect that there is likely a flexible connection between the first 3 domains and the others, so that the first 3 can adopt many orientations with respect to the remainder. If this is the case, then they would be structurally passive and not contribute to the formation of the dome (i.e., they might extend into the membrane footprint but presumably would not affect its shape much). In summary, the dome – defined geometrically by its area and radius of curvature – is formed by the rigid components of Piezo. The first 3 domains do not seem rigidly attached to Piezo. If, in a particular conformation of the channel, the first 3 domains adopt a more rigidly attached configuration, then they could increase the area and alter the energetics of Piezo. For now, the model is based on what we have been able to see. Viewed down the 3-fold axis the arms are indeed tucked inward. Viewed from other angles one can see that each arm adopts a left-handed helical twist such that it curls around an approximately spherical dome-shaped membrane surface. In other words, curving of the arms is actually consistent with a spherical dome-like shape. If one imagines that the arms remain adherent to the membrane surface as the dome decreases its radius of curvature (i.e., flattens), then the arms would indeed straighten out (i.e., become less tucked inward) as the dome flattens. Thus, straightening of the arms, at least to some extent, is expected. We want to emphasize, however, that the spherical dome model is an approximation of some more complex geometry. This approximation captures the essence of a system that we think works by pulling membrane area out of the membrane plane in the closed conformation and permitting that area to re-enter the membrane plane upon opening (i.e., by flattening). In detail, aspects of the structure of Piezo that cause deviations from the spherical dome shape (e.g., by breaking rotational symmetry about the central pore axis of Piezo) will perturb the shape of the membrane footprint and the magnitude of the energy. Nevertheless, the membrane footprint will contribute to the energetics of channel gating. To highlight this important point raised, we have added emphasis in the third paragraph of the subsection “Shape and energy of the membrane footprint” that the spherical dome is an approximation. We further address this point in the last paragraph of the aforementioned subsection and in the third paragraph of the Discussion section. This question was addressed in the calculation of membrane shapes and energies for three different gating scenarios in Figures 4 and 5. For the closed and opened radius of curvature, Rc and Ro respectively, we plot energy (Figure 4) and open probability (Figure 5) – and their slopes (sensitivity) – for values Rc→Ro (nm) corresponding to 10.2→∞, 10.2→11.2, and 20→∞. Thus, a change in radius of curvature as small as 10.2→11.2 nm (Figures 4B and 5B), for example, will in theory render Piezo quite sensitive to membrane tension. In Figure 5, the unknown protein energy difference between closed and open states (ΔGDP) was selected for each gating geometry so as to place the tension curve within the ranges shown (similar to experimental observation). In other words, we do show that the curvature changes rationalize those large energies. Incidentally, all of the analysis presented here entailed analytic or numerical calculations – in particular, solution of the Euler-Lagrange or Hamilton equations associated with equation 1 – rather than simulations. We have revised our manuscript to emphasize, in the second paragraph of the subsection “Influence of the membrane footprint on gating”, the rationale behind the gating geometries considered in Figures 4 and 5. Whether osmotic pressure is predicted by the model to activate Piezo1 depends on the scenario considered. In short, to the extent that an osmotic pressure difference across a cell membrane produces membrane unfolding and cell swelling – a regime in which the Young-Laplace equation will apply – the model predicts that an osmotic pressure difference will activate the channel through increases in membrane tension. That said, eukaryotic cells seem to have many compensatory mechanisms that minimize increases in membrane tension over a slow timescale. For example, caveolea appear to serve as membrane area buffers, allowing the membrane to ‘unfold’ when required. Thus, whether or not Piezo1 opens would seem to depend on the timescale over which a tension-inducing membrane perturbation occurs relative to the timescale of compensatory mechanisms (i.e., membrane unfolding, ion and water transport, etc.). To speculate with a specific example, rapid poking of the cell membrane opens Piezo1 channels (transiently), but an osmotic stress that would take more time to evolve might not. In summary, experimental tests to see whether Piezo1 can be activated by an osmotic pressure difference have to ensure that the Young-Laplace regime is achieved. As alluded to by the reviewer, chemical differences between the two lipid bilayer leaflets of the membrane may induce a spontaneous curvature of the membrane. We have revised our manuscript to discuss, in the first paragraph of the subsection “Shape and energy of the membrane footprint”, how spontaneous curvature of the membrane would enter our model of Piezo’s membrane footprint. To the first point, yes, Piezo’s membrane footprint should influence the distribution of molecules – both lipids and proteins – in the surrounding membrane. In particular, Piezo’s membrane footprint should attract lipids and proteins that exhibit an energetic preference for the curved shape of the membrane footprint, and repel molecules that “prefer” other membrane shapes. Thus, a prediction of the model is that molecules that couple to the membrane shape should show a distribution in the vicinity of Piezo that is different from their bulk distribution. Experiments to test this prediction are underway. The specific case of Piezo surrounding Piezo is queried. Yes, Piezo channels should interact with nearby Piezo channels through their respective membrane footprints. We agree with the reviewers and with the cited reference that Piezo pairs, it would seem, should repel each other. The possible influence that groupings of Piezo could have on each other is more complex and an interesting topic for further study. We note also that clustering of membrane proteins is often mediated by cytoplasmic anchoring proteins. The second point is a corollary of the first. Just as Piezo should influence the composition of its surrounding membrane, the composition of the surrounding membrane should influence the energetics of Piezo gating. That is to say, lipids or other proteins that integrate favorably into Piezo’s curved membrane footprint should alter the energetics of the footprint and thus alter the functional behavior of Piezo. This raises interesting possibilities for the regulation of Piezo gating in different membrane environments. The reviewers raise the special case of the ‘other protein’ being Piezo. Yes, we would predict that Piezo channels at a certain density should influence each other’s gating. Experiments to test this prediction are also underway. We have added these important aspects to the second paragraph of the subsection “Modulation of gating through the membrane”. We thank Yusong R Guo for preparing Figure 1A and B, and Osman Kahraman and Rob Phillips for helpful discussions. RM is an Investigator in the Howard Hughes Medical Institute.